Prolonged windy conditions will cause plants to need more water as wind contributes to the evaporation of water from within plants and from the soil. So the obvious thing to do is to create a shelter. A single row of wind resitant plants can help create some shelter. Every little bit helps and as the number of plants in the garden increase you can produce your own little micro-climate in which the less wind-resistant plants can survive. Don’t go over the top or your garden will feel over-shadowed. Another option is to build small banks that help protect from the wind. This solution may take up a little too much room in a small garden. 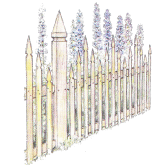 Fences and other garden structures can also be used to good effect to provide shelter. 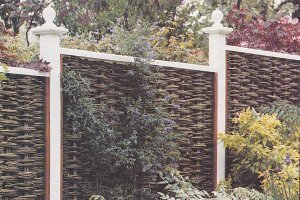 Open structures are better than solid ones as they dissipate the wind rather than deflect it, any fence with 50-60% porosity, such as woven hurdles of willow or hazel, will be effective. When wind hits a solid barrier such as a brick wall or panel fence it tends to deflect upwards only to descend with greater turbulence on the other side. Where possible several lines of defense are best. For instance an open fence with wind resistant hedging behind it. 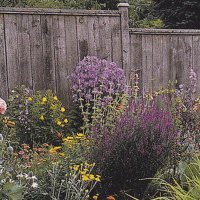 The other thing is to choose your plants carefully and choose those that are more resistant to winds. Pot plants can be very vulnerable to wind damage. Make sure your pots and planters are well secured or heavy enough to withstand windy conditions so you do not need to worry about them toppling over. Wind can cause all sorts of problems for plants but moderate winds can also be for good by helping with pollination and the removal of dead leaves. There is no point in trying to do the impossible and trying to eliminate the wind completely. Protect your plants from drying out or physical damage and leave it at that.